This week was Children's Mental Health Week. At the beginning of the year we made our class rules and decided that actually each rule could go into three categories: looking after yourself; looking after others; looking after the environment. We decided to focus our week on looking after ourselves, during mental health week. We looked at our shout out board, which we call ‘Looking After Others’. 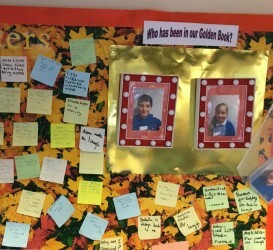 On the board, children can write post-it notes, about the kind things others have done. These can be anonymous or with their names, sometimes staff get shout outs too! Some are thanks for small things and some are for much bigger or personal issus, but all of the post-it promote positive recognition of the activities and behaviours within class. We discussed mental health and what may affect, contribute or be the outcomes of some mental health issues. The main issues covered were anxiety, depression, eating-related problems and anger. We looked at strategies and services people can use to help combat these, including mindfulness. We did some paired mindfulness activities and then had a guided meditation session to try to focus our mind and bodies to be in the moment. We want to reduce anxiety in class so will look at more mindfulness techniques and try to ensure the issues around anxiety are discussed and dealt with, to ensure all our children feel supported, listened to and stress free.